Sometimes, life drops explosive news on you. The news is by no means unpleasant, but it causes your face (and your brains) to go through a series of psychological expressions before you can actually react. I’m thankful for the fact that this piece of news came to me at a time when no one could really see those expressions, owing to lack of sufficient illumination. I guess I’m also thankful for the fact that there was no mirror around. I met her in 2004. The first time I saw her, her leg was bandaged. She’d been in an accident and was walking around with a limp. She was two years my junior, but taller and very lanky, and I remember being a little shocked at the (un)ambitious length of her shorts. She was obviously in pain, but very cheerful. We hit it off pretty quickly. We spent the afternoon chatting, the conversation surprisingly easy and free-flowing for a first. And then, in a few hours, it was time for me to leave. We promised to keep in touch. We met again a few months later – she was in town, visiting her father for a couple of weeks. This time, we bonded over shopping and lunch, the way teenagers do. We spoke about our closest friends, our families and our interests, and got to know each other a little more. After she left, we started staying in touch over the phone. There was something about her that appealed to me. In her apparent innocence, I could see overtones of maturity. Perhaps it was because I knew that she had had a very difficult childhood; she had lost her mother at the age of three, and ever since, her father had sought refuge in chronic alcoholism. He had even remarried, for a brief period; her stepmother seemed straight out of a Grimm’s fairy tale. I was actually amazed at her unrestrained appetite for life. On one of her subsequent trips, just after the 2005 deluge in Mumbai, we discovered a litter of puppies in the middle of the road. Their mother was nowhere to be seen, so we brought them home, and took care of them for the next three weeks. I was nineteen, she was nearing eighteen. Both of us were experiencing our first serious relationships. We would giggle and gush about our respective boyfriends from time to time over the phone. She met mine when he had come down to Mumbai, and I met hers. Technically, she’d been my partner in crime, more than once. One night, around the middle of 2005, she called me up, and started to cry. Her father’s alcoholism had taken a turn for the worse – he used to drink every night, and even had to be hospitalized a couple of times. That night, the way she put it, things had almost gone out of control. My parents heard about the situation from me. Knowing that her father wouldn’t live very long, they discussed asking him if we could adopt her. I had already started to love her like a little sister, and was more than willing to go ahead with the idea. Around the end of 2006, her attitude began to change. She started maintaining a calculated distance from me. At first, I thought she was genuinely busy, but then, it wasn’t really like her to not answer or return my calls or messages repeatedly. One day, a few months later, she asked me to stop “interfering in her life”. To “give her space”. At the time, I was already going through a bad phase, professionally, academically, even personally. Her words were extremely painful. She was a very close friend, and I needed her to be around, but her sudden, uncalled-for acerbity made it easier for me to stay away. I resolved never to call her again. We lost touch. I lived up to my resolution; she never attempted to contact me either. One day, a common friend informed me that her father had passed away. I did not know what I was supposed to do. Ideally, I knew I should call her, but her turning away from me, and our friendship, had hurt me so much, that I did not have the courage to do so. What if she refused to speak to me again, or said something I wouldn’t want to hear, like the last time? That would hurt me even more. And I did not know if I was ready to get hurt another time. After a lot of thought, I called her. She sounded strangely normal – not like a girl who had just lost her second parent, or who was talking to a former sister-figure whom she had told off so ruthlessly. I kept the conversation brief and formal. A few days later, I called again to check on her. It felt strange, as though I was being mechanical in my actions, as if it wasn’t concern but obligation that was making me call her, but that was the least I could do. That was the only thing I could do. Part of me was seething from within. It isn’t that easy, I wanted to yell at her. You were heartless and insensitive and you do not deserve someone like me. How can you even think that a simple three-liner will help me forget everything and attempt to “re-establish our friendship”? Did I not deserve more? A more elaborate apology? I decided I’d not call her. Two days later, I found myself dialing her number. She told me she had distanced herself from a lot of people over the past two years. And that after her father’s death, she wanted to re-build as many ties as possible. I empathized. But I could not spring back to my original self as easily as I had done earlier. I conveyed that to her, and she understood. Over the next half hour, we discussed briefly the highlights of the past two years, and when our conversation ended, her words, her tone, suggested that she wanted to attempt to make things up to me. She never called me again. Have you ever experienced a situation where you don’t know something, but really want to know about it, but then again, you don’t want to, because more knowledge will only cause you pain? I later learnt, purely by accident, that the boy was Canadian. He had worked with her father on a project; that was when they were first introduced to each other. They were married earlier this year. That is all I know. I don’t think I want to know more. I found her profile on Facebook recently. There was a picture of the couple, probably taken on their honeymoon. She looked happy. As though the ghosts of those tough years of the past had finally been laid to rest. I know I don’t need to know more. I spent the first sixteen years of my life in a house with a huge verandah overlooking a Gulmohar tree. 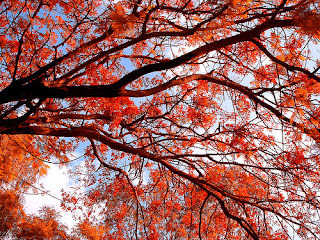 Twice every year, once during the summers and once during the winters, the tree would burst into cheerful red flames. And the stone-grey ground below would be dotted with red petals, or occasionally even the whole flower. I subsequently moved in to a new house. Unlike my old colony, which could only boast of limited greenery, my new apartment had a huge lawn with an assortment of trees. For some reason, though, there wasn’t a Gulmohar in sight. I did not realize how much I missed the tree till I found myself staring at Gulmohars every time I passed them. It took me a while to understand that subconsciously, the Gulmohar was actually a link back to my childhood. 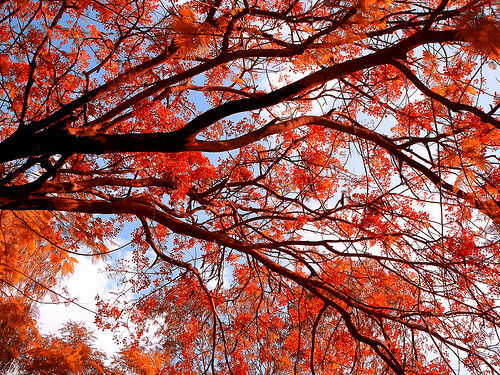 Even today, when I pass by a Gulmohar tree, I experience an emotion that is fairly overwhelming. Sometimes, I pick up a stray flower, bring it home, and keep it in a water-bowl. Otherwise, I simply look at the tree in all its red glory and smile, as if between us, we share a little secret. Not all memories are in black and white and sepia. Some are a cheerful red too!